Centrally located apartment, facing South West. 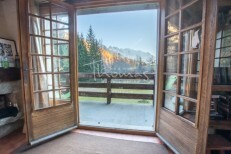 A rare opportunity to buy an apartment right in the heart of Morzine village with a South West aspect. The apartment comes with a ski locker, a storage room/cave and a parking space. The apartment consists of an open plan living and dining room with a fitted kitchen to one side and a balcony off the other. There is a separate double bedroom and a bathroom. This property is part of a building that includes 22 lots. Co-ownership charges for this property: 1606 euros p.a.